Chaparral is a very drought tolerant plant that has been known to live up to 2 years without water. Chaparral (Larrea tridentate or creosote bush) is an herb that dates back millions of years. It is known by many different names. In the Mediterranean it is known as ‘Maquis’, in Africa it is known as ‘Fynbos’, in Chile it is known as ‘Matorral’, and in the U.S.A it is known as ‘creosote bush’ or ‘chaparral’. It is a resinous evergreen shrub that grows from 4 – 12 feet in height. In this country it grows best in the southwestern United States and also in Mexico. The leaves contain saponins, a compound that makes foam when shaken in water. It is a very drought tolerant plant that has been known to live up to 2 years without water. Chaparral has a very deep root system. Because of this, when there are brush fires, they are able to live through it. For hundreds of years, many Native American tribes from Arizona, Nevada, Utah, Colorado and Mexico used it for its healing properties and cured a multitude of afflictions and maladies. Chaparral has been used for healing the following ailments: Abscesses, impetigo, inflammation, itching, allergies, kidney problems, blood poisoning, arthritis, boils, lymph glands, cancer, fungus, gout, herpes, immune system booster, wounds, sty, scalp problems, parasites, pet or animal tumors, ringworm, toothache, oral rinse, chicken pox, cold, chest infection, shingles, asthma, tuberculosis, venereal disease, sinusitis, tumors, cyst, eye disorders, cholesterol, bursitis and athlete’s foot. It is an antibiotic and antiseptic used for urinary tract infections, sores, and scabies. 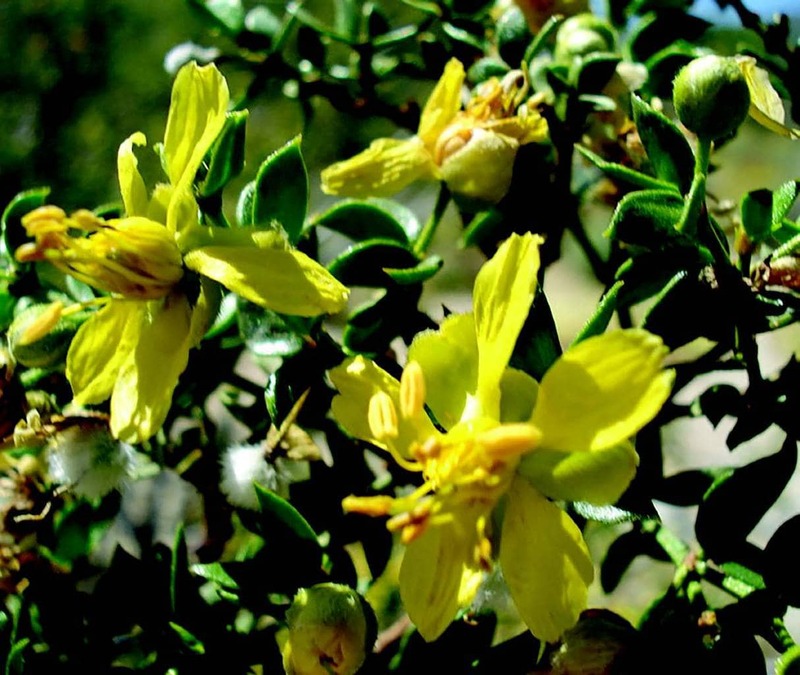 Considered a cure all, chaparral is known universally as a remedy for stiff joints, festering sores, poisonous bites, and menstrual cramps. It is also a powerful blood purifier. It cleanses deep into the tissues and helps to eliminate toxins. Chaparral contains potent antioxidants. They also fight free radicals (which can destroy cells). One drawback of Chaparral is that it doesn’t have a pleasant smell or taste. It is a bitter herb, and for many people the unpleasant odor makes it hard to ingest. It is also effective in removing harmful radiation from the body, and it contains sulfur and zinc. Both chemicals, zinc and sulfur, are very effective in fighting disease. Also, a most important bacteria-fighting chemical within the plant called NDGA (nordihydroguaiaretic) gives you the inspiration to give it a try. Chaparral is also used for sore teeth. It helps fight gum disease and tooth decay. The antiseptic properties make it an excellent mouthwash. To make a simple mouthwash use ½ tsps of chaparral tea; pour one 6 ounce glass of boiling water over it, and let it steep. After it has cooled, you can rinse your mouth with this to help fight germs. Add water as needed if it is too strong for you. It can be stored in the refrigerator. There are many tonic combinations that can be used with this herb for any of the above illnesses. Here is a general tonic that can be used for arthritis, tissue building, building the immune system and fighting infection: Put 1 tsp each of the following herbs in a stainless steel or glass pot, add ½ quart boiling water, and let them steep overnight: Echinacea powder or leaves, chaparral leaves, sarsaparilla root, red clover flowers, dandelion leaves or flowers. Strain the mixture, add honey to taste preference. Store in canning jars in a dark, cool place or refrigerate. This mixture can be taken daily, sweetened or not. The world has become quite polluted. The lungs, digestive tract, and circulatory system can always use a boost. Taking a tonic daily could be very helpful in fighting off toxins. Cancer is on the rise and, there are many formulas for it that use chaparral internally and externally. This is an old remedy for fighting infection and disease in the body. From 1842-1942 chaparral was listed in the United States Pharmacopeia, classified as an expectorant and pulmonary antiseptic. In researching this herb, we found that there are many warnings about it having side effects. It has been used successfully for centuries, however, if large doses are taken it can cause nausea, vomiting, and diarrhea, and overuse can harm the liver. There are other herbs that have the same description, a few are: turmeric, comfrey, skullcap, and kava kava. There are side effects to all drugs. Allah has placed the Shifa (healing) in natural herbs. A diet change may be necessary to achieve the best results, especially if you are combating a serious illness such as cancer. Chaparral is a strong herb that should be used in small doses at first. It is very beneficial to the body and is known as a cure all.